Dealing with a power outage is more than just a little inconvenient; it can result in expensive repairs needed, and can even be dangerous to your and your family. The majority of power outages we experience in New Zealand are usually repaired within an hour or two. In some serious cases though, power outages can last for days. Unexpected power outages can be frustrating, especially when you’re relying on it to go about your day or night. Luckily, there are ways to not only survive a power outage, but to prepare for one too. In order to properly prepare for a blackout, there are several things you can do before, during and after a power outage. Here, we discuss our top tips to protect yourself, your family and your wallet during a power outage. Whether a bad storm has hit or a power line has been knocked down, power can go out for a number of reasons. Utility companies will always do their best to restore power as soon as possible, but there is never a guarantee as to how soon this can happen. When the power has gone out, it’s important to disconnect all electronics from their outlets. Power spikes or surges can actually damage your appliances if they are still plugged in when the power comes back on. While it may seem like an obvious alternative to your normal electrical lights, candles are not recommended during a power outage. Candles put your home at risk of fire; it’s better to use battery powered or rechargeable flashlights instead. When the power goes out, there’s a good chance that municipal water will stop flowing shortly afterwards. Make sure you fill up the bathtub, sinks and buckets with water, so that you have a supply for drinking, washing and flushing the toilet. Although you may be bored and want to pass time by using your phone, it’s better to conserve the battery, as you really don’t know how long the power will be out for. Use your phone only for emergency calls, and to check your power company’s website to updates on when you’ll be back on the grid. If you need to recharge your phone, don’t forget your car battery holds plenty of power to charge mobile devices. As traffic lights will stop working during a power outage, you should eliminate any unnecessary travel, especially by car. If you do need to drive, take extra care at intersections where traffic lights aren’t working, and follow the give way rules. Once you have followed the above steps to safely protect your home and family during an outage, you may be wondering what there is left to do. As perishable foods are on borrowed time, now is the time to cook and/or eat refrigerated and frozen foods. If you don’t have a gas stove available, dust off the gas cooker or barbeque. Try to refrain from frequently opening up the fridge or freezer unless necessary, and make sure all food contents are packed tightly together to retain their chill. If your worried about your smartphone running out of battery, try making adjustments such as dimming the screen and reducing the auto-lock time. It’s also best to avoid using any apps that easily drain your battery, such as Snapchat or online games. For those who can’t access their power providers website during an outage, try listening to a portable radio. They generally give the latest information and updates on here. Don’t call 111 for updates - only use this in the event of an emergency. When was the last time you got out Monopoly or Cluedo to play with the family? For many of us, it was a long time ago - but now is the perfect time to relive these memories! Without the distraction of technology, families can dust off the old board games and enjoy a few games to pass the time. You never know just how long you’ll be without electricity during a power outage. With all of your appliances switched off, it can be hard to know when it’s back on! An easy solution to this is to leave on one light in the house, so that you’ll immediately know when the power is back up and running. Water is basic, yet it’s the most important element needed in our bodies. Stocking up on bottles of water by the gallon is the idea, as the general rule of thumb is to have one gallon of water per person per day. This is essential not only to prepare for a power outage, but for other disasters or emergencies. There’s no harm in preparing for the worst! Survival kits should be an essential in every home, to ensure you’re prepared and protected for any unseen events. Don’t be left in the dark during an outage! Make sure that you have alternative lighting - such as battery powered or rechargeable torch - ready in an easy to access location in your home. Do you solely rely on your oven and/or microwave to cook foods in your home? If so, you may want to consider investing in an alternative that doesn’t rely on electricity, such as a gas BBQ or cooker. Surge protectors are electrical devices that help to protect your electrical equipment against power surges and voltage strikes. Without surge protectors, your appliances could be damaged during an outage. Are you experiencing an outage now? If you’re currently experiencing a power outage, it’s important to first determine if the outage has already been acknowledged by your power company, as they could already be working on fixing the problem. When the power goes out, power companies are often be inundated with customers reporting the outage or fault. In the majority of cases, they are already aware of the problem - so be sure to check their website first for any outage notices before making a report yourself. If you don’t have access to the internet to check for updates, it’s likely that your power provider has a phone line you can call that provides the latest power outages and restoration information for users. Want to see if there are any current outages in your area? You can use the Wellington Electricity website to check for updates - this includes the Hutt Valley and Kapiti Coast area. If you are currently experiencing an outage that isn’t listed on the website, you can report a Wellington power outage here. If you’re experiencing an outage in the greater Auckland area, you can use the Vector website for any updates. If there is a known outage in your area, you can sign up for the latest updates to be sent direct to your phone. To report an Auckland power outage, you can send this direct to Vector to look into. When there’s a power outage in Christchurch, Orion has an advanced network management system that immediately identifies almost all outages. You can use their website to check for current and planned power outages, as well as report a Christchurch power outage. Having the right items purchased and stored can make a huge difference when dealing with your next power outage - and you’ll thank yourself later for being well prepared! By following the above power outage preparation tips for before, during and after the incident, you can ensure that both your home and family are ready to tackle the next blackout. 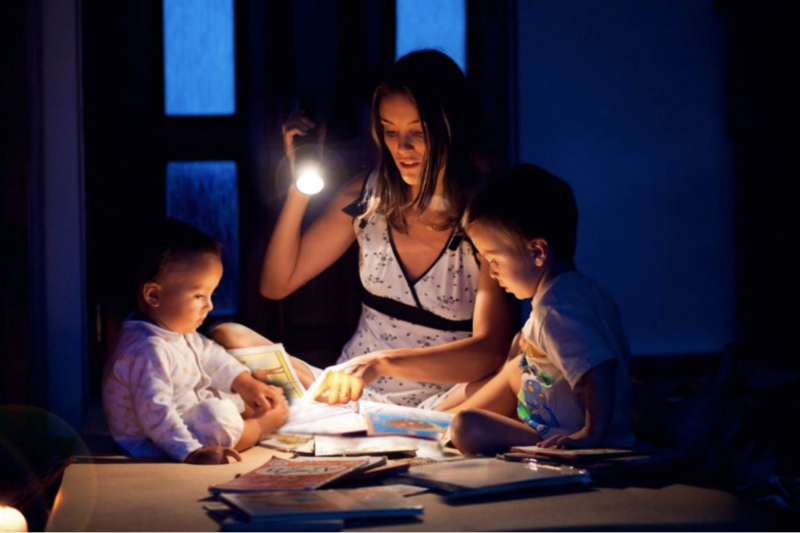 Be sure to educate your family or any other household members on what to do in the event of a power outage, as they should be ready and know what steps to take as well.